The Wandering Earth (Chinese: 流浪地球) is a 2019 Chinese science fiction film directed by Frant Gwo, based on the novella of the same name by Locus Award and Hugo Award-winning author Liu Cixin. It stars Qu Chuxiao, Li Guangjie, Ng Man-tat, Zhao Jinmai, Wu Jing and Qu Jingjing. The film was theatrically released on 5 February 2019 (Chinese New Year's Day), by China Film Group Corporation, followed by North America and Australia on February 8, 2019. It is a box office success, grossing over $655 million worldwide, including $650 million in China. It is China's second highest-grossing film of all time, 2019's highest-grossing film worldwide, the second highest-grossing non-English film of all time, and one of the top 20 highest-grossing science fiction films of all time. It has received generally positive reviews from critics, with The Hollywood Reporter describing it as "China's first full-scale interstellar spectacular." Netflix has acquired the film's global streaming rights. 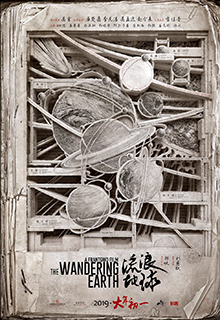 The Wandering Earth (Chinese: 流浪地球) is a 2019 Chinese science fiction film directed by Frant Gwo, based on the novella of the same name by Locus Award and Hugo Award-winning author Liu Cixin. It stars Qu Chuxiao, Li Guangjie, Ng Man-tat, Zhao Jinmai, Wu Jing and Qu Jingjing. The film was theatrically released on 5 February 2019 (Chinese New Year's Day), by China Film Group Corporation, followed by North America and Australia on February 8, 2019. It is a box office success, grossing over $655 million worldwide, including $650 million in China. It is China's second highest-grossing film of all time, 2019's highest-grossing film worldwide, the second highest-grossing non-English film of all time, and one of the top 20 highest-grossing science fiction films of all time. It has received generally positive reviews from critics, with The Hollywood Reporter describing it as "China's first full-scale interstellar spectacular." Netflix has acquired the film's global streaming rights. In the future, the Sun has aged and is about to turn into a red giant, pushing the nations of the world to consolidate into the United Earth Government, a world government, to initiate a project to move the Earth out of the Solar System to the Alpha Centauri system, in order to preserve further human civilization. Enormous thrusters running on fusion power are built across the planet to propel the Earth. Human population is reduced severely due to catastrophic tides that occur after the planetary engines stop Earth's rotation, and later as the planet moves away from the Sun, much of the surface is frozen due to lowered temperatures, forcing humans to live in vast underground cities built adjacent to the engines. At the beginning of the film, Liu Peiqiang, a Chinese astronaut, promises to his son Liu Qi of his eventual return before his mission to a space station that will help Earth navigate as it moves out of the Solar system, and hands guardianship of his son over to his father-in-law Han Zi'ang. Seventeen years later, Liu Peiqiang's mission is about to end and he will soon return to Earth. To celebrate Chinese New Year, an adult Liu Qi brings adopted sister Han Duoduo on a trip to the surface in a truck they steal using Han Zi'ang's clearance as a trucker. They are arrested, and meet Tim, and are joined by Han Zi'ang after an unsuccessful attempt to bribe the prison warden into releasing them. As Earth passes by Jupiter to make use of gravity assist, Jupiter's gravitational spike causes devastating earthquakes that disable many thrusters across the globe and pull the Earth dangerously close. The four escape amidst the chaos and attempt to make their way out in Han Zi'ang's truck, but the truck is requisitioned for a rescue mission by the military rescue team CN171-11; they are to transport a lighter core, an engine component, to restart the planetary thruster engine in Hangzhou, supervised by soldiers led by Wang Lei. In the remnants of Shanghai, they lose their vehicle, and while transporting the component up the ruins of the Shanghai Tower Han Zi'ang is killed. With news that the Hangzhou thruster was fully compromised and the city was completely destroyed, the group temporarily despair. However they later find a new vehicle where the on-board engineer, Li Yiyi, convinces them to transport an lighter core to repair a larger planetary thruster engine in Sulawesi. In space, Liu Peiqiang discovers that MOSS, the artificial intelligence commanding the space station, has directed it to escape rather than to assist the humans on Earth. He breaks out of forced hibernation and attempts to stop the space station along with Russian cosmonaut Makarov, who killed by the spacecraft's automated security measures. Liu Peiqiang arrives in the control room, but his clearances are revoked due to his acts of insubordination and he can do little to override the escape process. Liu Qi's group arrive at Sulawesi to find that the engine was already fully restored. Globally, most of the planetary thrusters have been repaired as well. However, the gravitational pull from Jupiter is too great and Earth continues to move toward it, approaching the planet's Roche limit. The group despairs on learning this, but Liu Qi, inspired by recollection of his father's explanation of the thrusters' mechanics as a child, proposes to ignite Jupiter's hydrogen abundant atmosphere to blow Earth away. Li Yiyi proposes to concentrate the Sulawesi engine's power to fire a beam high enough to ignite Jupiter. The group overcome various challenges, such as renewed aftershock tremors that injure several members, and are able to mostly reconfigure the engine to carry out the plan, however they are not able to push the firing pin of the engine to ignite it. Liu Peiqiang, learning of this, is able to persuade the United Earth Government to use its communication channels to call assistance for the party at Sulawesi, even though MOSS reveals that the solution being attempted was already proposed by others and has no chance of success based on probability calculations. Other rescue and repair parties arrive and the engine is fired up, but it falls short of being able to ignite the hydrogen. Liu Peiqiang decides to use the space station's engine itself to ignite Jupiter's hydrogen; after disabling MOSS using a fire started with vodka that Makarov smuggled on-board, he pilots the spacecraft into the cloud between Jupiter and Earth, sacrificing himself as the ignition succeeds. Earth is saved from destruction and continues to move towards the destination star system. As the film ends, Liu Qi recounts and envisions the stages of Earth's migration, a process to take 2,500 years and still bound with uncertainty, in a hopeful tone. The film shares the same basic setting with the novella, but the plot has significantly changed. In the novella, the earth passes the Jupiter orbit without the key crisis in the film; however, there is a large debate amongst mankind, concerning whether the prediction was true that the sun would undergo a helium flash and devastate the Earth, and whether the United Earth Government had cheated mankind by organizing and carrying out the "Wandering Earth" project. In movie there are indeed protestors holding signs claiming the "sun will not have helium flash" and MOSS final word is a references to top leader of United Earth Government from the novel. After 40 generations, this eventually evolves into a worldwide conflict, until the helium flash actually takes place. The Earth escapes this, and continues its migration with the mankind beyond the Solar System. Frant Gwo was a big fan of the science fiction genre and was first influenced by James Cameron's Terminator 2: Judgment Day which inspired him to become a director in the genre. He spent the following years studying the genre to direct a science fiction film. In order to establish a rigorous setting, Gwo invited four scientists from the Chinese Academy of Sciences (CAS) to act as consultants. The film's three thousand concept maps and more than eight thousand sub-mirrors were elaborately created by a conceptual art team of three hundred people over a period of 15 months. Principal photography started on May 26, 2017, in Qingdao, a seaside city on north China's Shandong province, and wrapped on September 27, 2017. Weta Workshop made the film's highly specialized spacesuits, exoskeletons and weaponry. The visual effects of the film were made by Base FX (VFX Supervisor: Varun Hadkar), Bottleship VFX, Dexter Studios, Macrograph, More VFX, Pixomondo and Black Nomad. "My film was successful but I don't want to speak about only one successful film and China's sci-fi movies could be find a new way for being better in 2019" The Movie director, Frant Gwo told to the China.org.cn Liu Cixin, the author of the original novella said to state broadcaster China Central Television, "Chinese studios have no interest to invest in sci-fi films. US sci-fi film audiences have trust but this trust between audiences and China's sci-fi movies doesn't exist yet and this is the main difference between Chinese and US sci-fi films." He said "It is a challenge because this trust must build between producers, investors, and the audience until people have faith in a Chinese sci-fi movie." The film's soundtrack was composed by Roc Chen (Chinese: 阿鯤) and Liu Tao (Chinese: 刘韬). On 25 December 2018, the first official trailer for the film was released at the China Aerospace Museum in Beijing along with a teaser poster. On 30 January 2019, Beijing-based distributor China Media Capital (CMC Pictures) announced that it has secured the international rights and is planning a sizable North American release on February 8. The company will open the film in 22 cities in the U.S. and three in Canada, as well as throughout Australia and New Zealand. On 20 February 2019, it was announced that Netflix acquired the distribution rights to stream the film internationally. The film will be available to stream globally on Netflix, outside of China, sometime in 2019. The Wandering Earth released over the Lunar New Year holiday season, and earned more than CN¥2 billion (£232 million) in six days, setting a new record for a Chinese film. Second weekend box office dropped 53%, on par with all other currently playing films post Chinese holiday season, as expected. As of 26 February 2019, the film's total gross in China stands at CN¥4.41 billion ($652 million), as the movie continues to play well in China. Internationally, it topped the worldwide box office with a three-day opening weekend gross of $172,718,000, and had a six-day opening gross of $289,090,290. The film has grossed $4,898,720 in the United States and Canada, $947,081 in Australia, and $211,450 in New Zealand, for an overseas total of $6,057,251 and a worldwide total of $655,324,793 as of 24 February 2019. The film received a generally positive reception in China. Several state-run media publications have given the film a positive review. Specifically, Zhong Sheng, in the People's Daily, writes that the film is "not superheroes saving the world but the mankind changing their destiny together." On Douban, during the initial release the movie had a 8.5 rating; it gradually fell and maintained at 7.9 as of the early morning of February 23th in China. Most reviews offered scores of 4/5 or 5/5, citing the fine production quality, detail, and unique ideology. Some commenter, specifically in Douban, who give the film negative comment are accused to be in bad faith. Tasha Robinson of The Verge describes the film as "rich, gorgeous, and goofy". Travis Johnson, of Flicks.com.au gave the film four out of five stars and, whilst criticizing the film for its lack of character development, praised the visuals and called it the best science fiction film of 2019. Ben Kenigsberg in the New York Times wrote that the film is "as awash in murky computer imagery, stupefying exposition and manipulative sentimentality as the average Hollywood tentpole", but that it proved that the Chinese film industry "can hold its own at the multiplex." Simon Abrams of RogerEbert gave the film three and a half stars out of the four, and saying the film was "visually dynamic, emotionally engaging." ↑ 周静. "Chinese sci-fi writer to get five movie adaptations". china.org.cn. Retrieved 2018-11-03. 1 2 3 "The Wandering Earth (2019) - International Box Office Results". Box Office Mojo. Retrieved 25 February 2019. ↑ "《流浪地球》定档2019大年初一中国科幻冒险启程". Global Times (in Chinese). 2018-10-26. Retrieved 2018-10-30. ↑ "Box Office: 'How To Train Your Dragon 3' Tops $170M, 'Wandering Earth' Tops $560M". Forbes. February 17, 2019. Retrieved February 17, 2019. 1 2 Chilton, Louis (2019-02-21). "Netflix buys streaming rights to world's highest-grossing film of 2019 so far". The Independent. Retrieved 2019-02-22. ↑ Brzeski, Patrick (4 December 2017). "Chinese Film Sector Charts a Course for a Sci-Fi Blockbuster to Call Its Own". The Hollywood Reporter. ↑ Brzeski, Patrick (20 February 2019). "'Wandering Earth' Director on Making China's First Sci-Fi Blockbuster". The Hollywood Reporter. Retrieved 21 February 2019. 1 2 "刘慈欣又一科幻神作将搬上银幕 《流浪地球》青岛开机 《同桌的你》导演执导". Mtime (in Chinese). 2017-05-31. Retrieved 2019-01-19. ↑ ""做科幻电影不仅仅是没有钱这么简单" 《流浪地球》曝科幻特辑 揭秘筹拍四年幕后". Mtime (in Chinese). 2018-11-14. Retrieved 2019-01-19. ↑ 巴塞电影 (2017-09-28). "两部重头戏同一天杀青，明年国产片要有大动静". Sohu (in Chinese). Retrieved 2019-01-19. ↑ "Sam Gao's Middle Earth, Wandering Earth and WETA". Radio New Zealand. 2018-07-06. Retrieved 2019-01-29. ↑ "Weta Workshop Movie and TV projects » Weta Workshop". www.wetaworkshop.com. Retrieved 2019-02-02. 1 2 3 Kuo, Lily (11 February 2019). "China challenges Hollywood with own sci-fi blockbuster". The Guardian. The Guardian. Retrieved 13 February 2019. ↑ "国产科幻《流浪地球》曝预告定档大年初一吴京"成了是英雄死了是烈士" 作者刘慈欣站台". Mtime (in Chinese). 2018-10-25. Retrieved 2019-02-02. ↑ "China's First Big-Budget Sci-Fi Movie 'The Wandering Earth' to Get U.S. Release (Exclusive)". The Hollywood Reporter. 2019-01-30. Retrieved 2019-02-01. ↑ Tartaglione, Nancy (20 February 2019). "Netflix Lands 'The Wandering Earth'; Sci-Fi Smash Is #2 Movie Ever In China At $600M+". Deadline Hollywood. Retrieved 21 February 2019. ↑ Mendelson, Scott. "Box Office: 'Wandering Earth' Drops 53% But Tops $500M In China". Forbes. Retrieved 2019-02-16. ↑ "流浪地球 - 猫眼电影". 猫眼电影. Retrieved 2019-02-26. ↑ "Comscore Announces Official Worldwide Box Office Results for Weekend of February 10, 2019". Comscore. 10 February 2019. Retrieved 24 February 2019. ↑ Zhang, Yan (2019-02-12). "《流浪地球》何以动人". Guangming Daily (in Chinese). Retrieved 2019-02-13. 1 2 "《流浪地球》折射源自现实的未来感（钟声）". People's Daily (in Chinese). 2019-02-14. Retrieved 2019-02-15. ↑ Zeng, Yuli (2019-02-09). "关于《流浪地球》的喧哗声：让人类保持理智真的很难". The Paper (in Chinese). Retrieved 2019-02-13. ↑ Yuqi, Hu (2019-02-13). "《流浪地球》再好 也要经得起批评". Beijing Daily (in Chinese). Retrieved 2019-02-14. ↑ Robinson, Tasha (2019-02-09). "China's blockbuster The Wandering Earth is rich, gorgeous, and goofy". The Verge. Retrieved 2019-02-13. ↑ Johnson, Travis (2019-02-08). "Chinese blockbuster The Wandering Earth might be the best sci-fi movie of 2019". Flicks.com.au. Retrieved 2019-02-13. ↑ "'The Wandering Earth' Review: Planetary Disaster Goes Global". New York Times. 2019-02-17. Retrieved 2019-02-18. ↑ Abrams, Simon (February 15, 2019). "The Wandering Earth Movie Review (2019)". RogerEbert.com. Retrieved February 26, 2019.